Manchester, England is known for many things and sunny skies is not one of them. The front of the house gets very little light and the previous owners went for coffee coloured walls in the entry, stairs and landing. Now I love a latte and my living room is coffee coloured, but the ‘latte look’ is one of the hardest paint colours to crack in my humble opinion, pick the wrong tone and your walls look just look dirty. The previous owners tried for the latte look, but the shade they went for combined with the very little and very cold natural light of the hallway resulted in walls that said ‘ugh’! 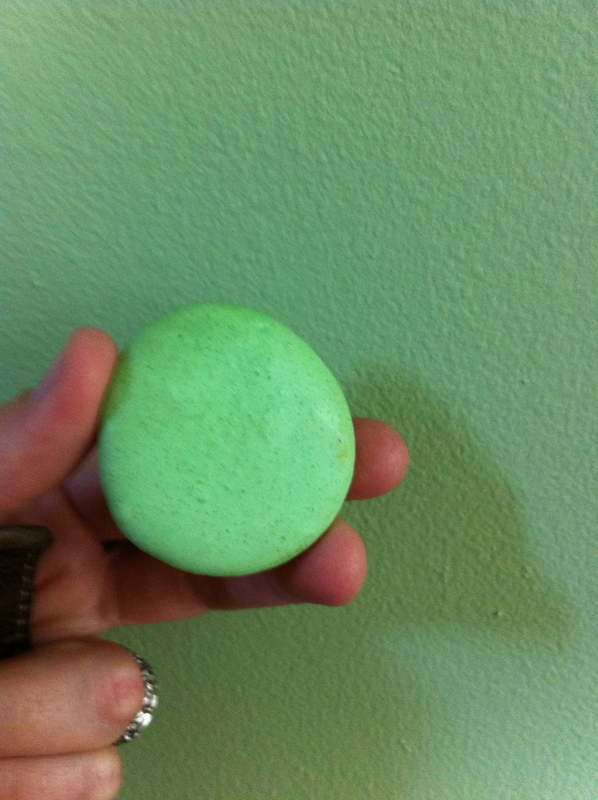 I decided on a green hallway, but a warm non-minty green with Laduree pistachio macarons as my inspiration. In a moment of sheer crazy (considering I have been known to buy a dozen tester pots before I’m happy with a colour) I picked foliage and hoped for the best. Some before and afters below, with blogdog acting as chief inspector of home improvements. This entry was posted on January 19, 2014 by The Sourcerist in 1930s House and tagged before and after, Entry, Hall, Macaron, Stairs, zerotohero.